Phone to emergency laptop via the Microsoft UFK? 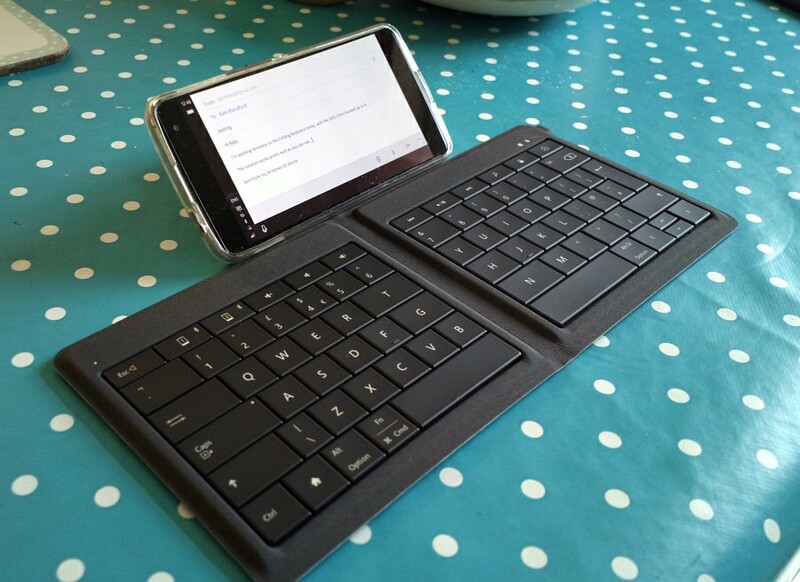 Back in mid 2015, two and a half years ago, Microsoft debuted the premium Universal Folding Keyboard (UFK) and I reviewed it here, pronouncing it massively overpriced (£100) and with poor Windows Phone support. Then, exactly a year ago, I briefly reviewed the UFK again in the light of a new price (£40) and Windows 10 Mobile's far more complete Bluetooth profiles - ending up recommending it to all. What's new here then? Not much, except that I've been using it for a year and I wanted to put into context - the UFK is more than a humble Bluetooth keyboard, yet (obviously) less than a laptop. So where does it fit in? 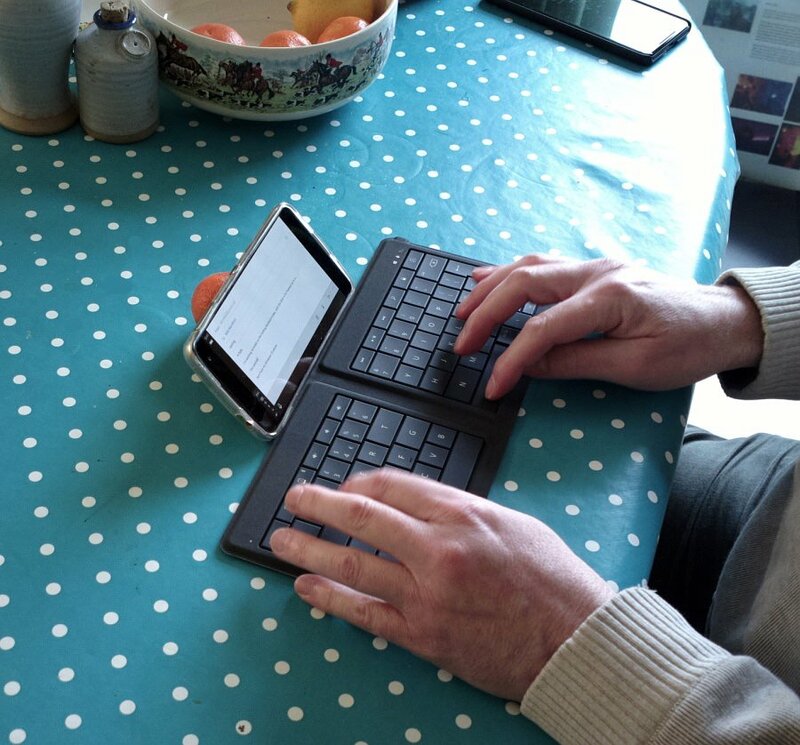 Bluetooth keyboards have been a 'thing' for over a decade, most readers will recognise the plasticky fold-out contraptions of yesteryear. Initially with AAA batteries in, with fold out phone stands on the back, with intricate interlocking lugs and ribbon cables, Bluetooth keyboards that were small enough when folded to carry around yet which broke at the first sign of rough use, which always felt cheap and klunky, and you always felt like a prize nerd when using them in public. Then, around five years ago, we started to get other designs - full width, full size keyboards that fitted nicely in a compartment in a briefcase but which were hopelessly large to carry around in a jacket or coat pocket (e.g. here). Plus keyboards that rolled or folded in other ways, usually to make them 'long and thin' and therefore more pocketable but at the expense of introducing too many reliability concerns (e.g. here). I've tried them all, from the original Think Outside designs for Palm Pilots through the classic Nokia SU-8W (the best of the old plastic guard) and onto the designs linked above. Yet they all pale besides the Microsoft UFK, which is the Rolls Royce of the Bluetooth keyboard world. can pair with two separate phones or tablets at the same time, so you could don't have to worry about disconnecting one before connecting the other - there are hardware buttons to switch connection. is water-resistant, so you don't have to worry about it getting wet in a jacket pocket or if you spill a drink, etc. Add in the premium materials and I've only been more and more impressed by the UFK as time has gone on. You do get used to the 'gap' in the middle and in my case it meant doing more 'proper' touch typing and less 'hands wandering' hunting and pecking. The gap is a necessary feature though, as it means no plastic hinges or mechanisms to break, no key interlocks. Which means the UFK will last longer - years rather than months. The main use case for me is when I'm travelling with family, out and about, and usually with a modern smartphone with large screen. 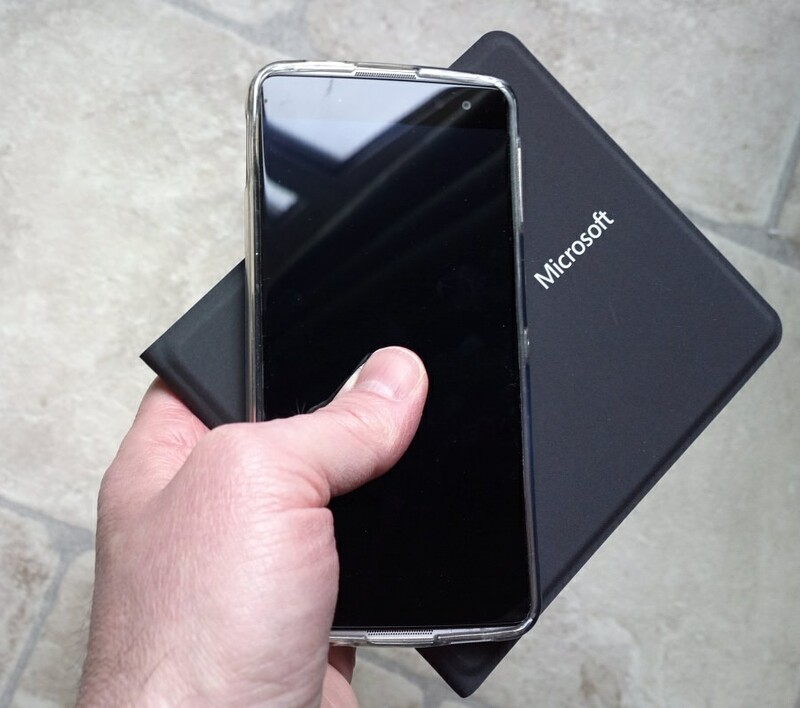 So 5.7" for the Lumia 950 XL or 5.5" for the IDOL 4 Pro (for example). Just large enough that, with the software keyboard not needed on-screen and with the virtual Windows controls swiped away, the landscape phone becomes a small monitor, on which you can use Windows applications like Outlook Mail, Word, Excel, Tweetium, and so on. The kicker is that if I was out and about with the fore-knowledge that I'd be spending an hour typing, doing work, then I'd probably have smuggled along a laptop of some kind. But this is a pain, a give-away for the wife to complain(! ), and a possible security risk (having to keep hiding it in the car boot, etc.) But something like the UFK is small and light enough to fit in a coat pocket and - basically - left in place for when needed. No need to remember to bring it, no need to charge it (more than once a month, perhaps), you find yourself with 10 minutes spare and some emails to send or a review to write (in my case), you whip it out, unfold it and you're off and working. With no fold-out phone stand (again, these were always fragile and fiddly), you do sometimes have to borrow a small object to proper the phone screen up, as seen on this page. There's always something around though - and phone stand gadgets are only a couple of pounds if needed for your wallet or pocket. Once you get the hang of the gapped keyboard, once you plug in headphones (or use Bluetooth audio) and get the feel of being able to control your music, then you really are in a little ultra-mobile world of your own. And when you're done, ten minutes later, you snap the UFK closed and pocket it. And you're on your way again. So yes, Bluetooth keyboards are still a niche in the market. But a jolly useful one - for me, at least. 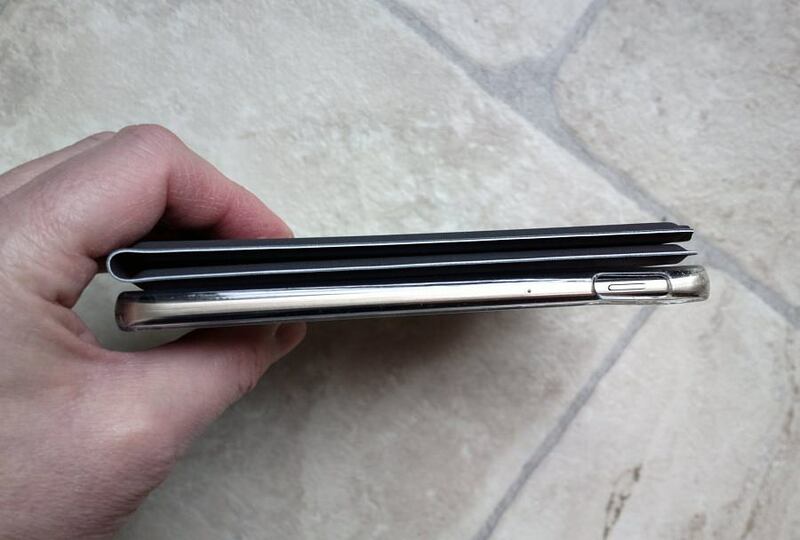 And the UFK has proved by far the best such accessory I've ever owned - it's flexible, functional, and pocketable. What about you? Would a premium Bluetooth keyboard fit your or your family's lifestyle? What about the UFK and the gapped layout, have you got used to it too? Comments welcome! PS. The UFK is still readily available at the stable £40 price on Amazon UK here. 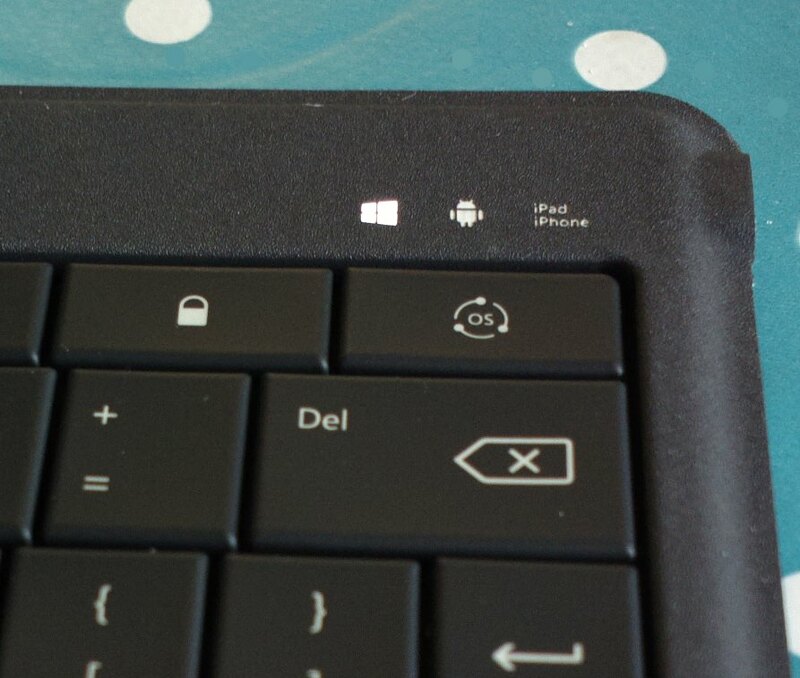 Filed: Home > Features > Phone to emergency laptop via the Microsoft UFK?